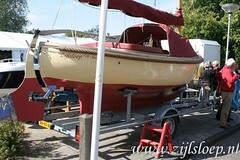 The Zijlsloep has been designed to rig the ship, sail and moor single-handedly. As the wind (and ships speed) increases, so does the directional stability. The Zijlsloep sails at its best at wind-speeds 3-5 bft, but 6-7 with a reef is still well to handle. In the design we choose a classic cat rigging, with boom and gaff, all in wood. The pivot point of the sail is, with good trimming, right above the pivot point of the hull. The standing rigging is limited and there is only a Main-sail. The main-sheet passes through a rotate-able floor block with a curry-clip so that the sail can be fixed and disconnected easily. 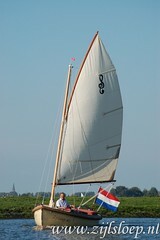 The (classical beige) 15m2 mainsail is bordered by lazy jacks, so that raising and lowering the sail can be accomplished by one person without the sail falling into the tub. The boom, with lowered sails, is attached the crane line (peak halyard), so a boom support is not necessary. A single reef is provided. For bridges and road transport, the mast can be taken down and put on the supplied support, even by a single person. A jib is absent. Simplicity is paramount. In several of the pictures you can see the Classic Zijlsloep with and without front cover (that can serve as a great dodger). The boom is high enough to sail with the front cover up, and bowing to tack or jibe is not necessary.